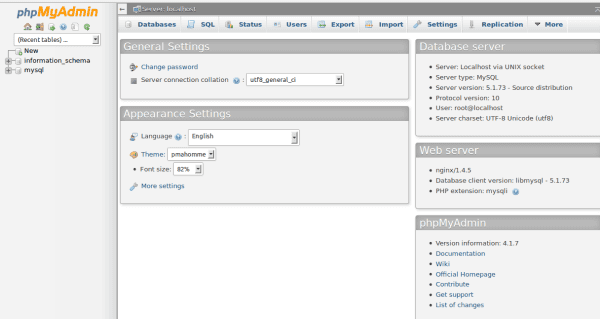 Phpmyadmin is a free tool used to administrate MySQL . it supports all major operation with MySQL in GUI mode. In the previous post we saw about installing and configuring nginx on centos 6.5 . Here we can see about installing phpmyadmin on nginx server. Step 1 » Enable EPEL repository for installing dependencies . Find the latest release file from EPEL 6 repository and install using rpm command. Step 2 » Install dependencies by the below command. Step 3 » Download latest phpmyadmin from official site ( Phpmyadmin Download ) to /usr/share/ directory. choose .tar.bz2 for less size and easy extraction with default tar command. Step 4 » Extract the files using the below command. Step 5 » Rename the folder . Step 6 » Create a config file inside phpmyadmin folder. just copy config.sample.inc.php into config.inc.php file . Step 7 » Create a virtual site to access phpmyadmin in 8080 port . Create a file /etc/nginx/conf.d/phpmyadmin.conf and add the below lines . Step 8 » Restart nginx service. Open /etc/sysconfig/iptables file and add the following line to open port 8080 in iptables. Step 9 » Now open http://serverip:8080 in your browser . you could see phpmyadmin login page . use mysql root username and password to login . after logged in, you can see the page below. properly. Also ensure that cookies are enabled in your browser. Same thing here 🙁 On Stack Overflow they sayd that you have to flush your browser cache/cookies, but no luck. Also something with “session.save_path” in the /etc/php.ini file. Does anyone know how to fix this? how can i do to redirect login to a https?